Brother and sister, from the same litter. One 14 lbs the other 3 lbs. One loves snow and being outside, the other doesn't. One is a big lug, loves to meet new people and snuggles with me until he gets too hot. He then lays down a few feet away to keep an eye on us until he cools down and then back up to lay beside me. One is a little more apprehensive and barks when she meets someone new, but she is my lap dog where ever I am sitting. Quite often I am picking (and sometimes) cutting crafty things out of her hair. She doesn't seem to mind, as she paws to come up each time I sit down. These little treasures get me up way before the sun rises, but both bring us such joy and companionship. I know they aren't still really puppies as they are over 4 years old, but they will always be our puppies to us. 90lb. Irish Setter, named Bailey. She believes she's a lap dog too! It's true, they'll always be our puppies... Thanks for sharing. How sweet! Animals really add so much to our lives, don't they? Our lives would be so lonely without them. 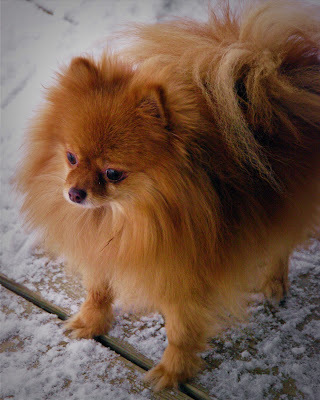 I love to see dogs in the snow. Adorable! We have Bassets and they are a hoot! They are so sweet! And I know great companions. I love dogs. My kids want one. But my husband not so much! So we compromise and have a cat! Still, one day, I will have a dog again. Oh, what sweet puppies. How funny that they are from the same litter. They are just adorable. Our puppies are both little white dogs. One is a nine pound Maltese. She is about seven and is the Alpha dog. Rules the roost. 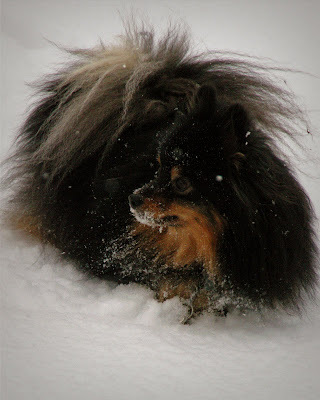 The other is a Bischon rescue dog who came to us at nine pounds, covered with snow and ice. It appeared that someone just let her go in the Minnesota winter. Poor dear. He came to us at nine pounds and now weighs eighteen pounds but worships at the feet of the little one. Oh, I miss those dogs. They are so comforting!!! Jud, myself, and Jud's were both so touched by your note on Caring Bridge today, Sheila. I had forgotten (or didn't know) that your "other" mom died of pancreatic cancer. You have some real understanding of what this is like. I am still so grateful to you for the scrapbook and cannot wait to get home to see it! Aww...sweet babies. They will always be your puppies indeed...too sweet! Wow! How did one get to be 14 and the other only 3!? That's crazy. They are beautiful! Our family just added a new baby girl Malshi to our family. And she is absolutely lovely! I'm so obsessed with small dogs now. I will forever be a small dog owner now. Oh they are sooooo adorable! And your little girl who paws to get on your lap each time you sit down sounds just like my pug pebbles who does the same exact thing, it doesn't matter to her if I'm using the computer or scrapbooking or whatever she wants to be on my lap. What loves, thanks for sharing! !